Games, crafts, recipes, activities, and a new song for celebrating love and exploring colors with your group. 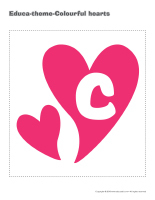 (Open educa-theme-Colourful hearts) Print and laminate the different elements representing the theme. Use them to present the theme to your group (and their parents) while decorating your daycare. 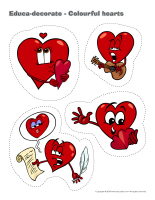 (Open educa-decorate-Colourful hearts) Print, laminate, and cut out the illustrations. Use them to decorate your walls and set the mood for the theme. 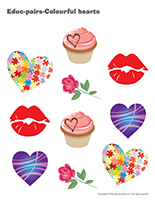 (Open Models-Colourful hearts) Print and let children decorate the garland elements. Cut out the items and use them to create a garland that can be hung near your daycare entrance or within your daycare. 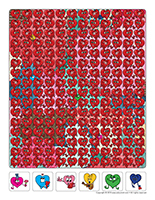 Create a special wall (Open educa-theme-Colourful hearts). Print, laminate, and cut out the items. Use them to decorate your wall and set the mood for the theme. Trace a large heart on a piece of red paper and display it on your wall. Invite parents to help you decorate the wall. (Open heart memos) Print several copies and set them near your daycare entrance so parents can pick a kind word for their child each day. Encourage children to tell you kind words they would like to write on the wall for a special friend. Examples: kind, nice, happy, lovable, adorable, cute, pretty, charming, great, respectful, beautiful, etc. To welcome children and introduce your theme, use a red or pink makeup pencil to draw a heart on their cheek. Serve each child a red fruit cocktail in a pretty glass decorated with heart stickers. Above your circle time area, hang a multitude of hearts from the ceiling using different lengths of string. At snack time, serve fresh fruit (watermelon, cantaloupe, apple slices, etc.) that you have cut with heart-shaped cookie cutters. This tool was created in response to a special request received. (Open Important telephone numbers) Print and complete the list so you always have all necessary phone numbers on hand. The pictures may be used as a memory game or to spark a conversation with the group. Use them to decorate the daycare or a specific thematic corner. 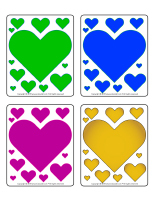 (Open picture game-Colourful hearts) Print, laminate, and store in a “Ziploc” bag or in your thematic bins. 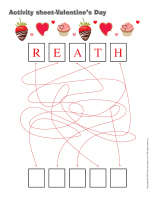 (Open writing activities-H like Hearts) Print for each child or laminate for use with a dry-erase marker. (Open stationery-Colourful hearts) Print. Use the stationery to communicate with parents, in your writing area, or to identify your thematic bins. 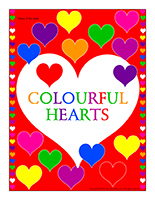 (Open educa-nuudles-Colourful hearts) Print for each child. Have children color the sheet and use Magic Nuudles to give it a three-dimensional look. Variation: You don’t have Magic Nuudles? Have children fill the spaces designed for Magic Nuudles with bingo markers or stickers. To order Magic Nuudles. (Open scene-Heart kingdom) Print, laminate, and cut out. Children use the various items to decorate the scene. The educatall team suggests you organize a special heart-filled week to celebrate Valentine’s Day. For each day of the week, we have prepared different activities that you can adapted for your group as you see fit. You will need several spray bottles or squeezable bottles. Fill the bottles with water and add a few drops of food coloring (beware of stains) to each one. Let children use the bottles to draw hearts on the snow in your yard. They will love coloring the snow. If you don’t like the idea of using food coloring, you can simply recycle the felts from old markers by removing them from the tubes and letting them sit in water overnight. Another option is adding Kool-Aid to your water…it will have a fruity scent as a bonus! Ask around to find a red or pink bed sheet. Have children stand around the bed sheet and deposit lots of Fun Foam hearts on it. Invite children to lift the bed sheet off the ground and shake it vigorously to send the hearts flying in the air. They will fall to the ground, like rain. If you prefer, you could also use your parachute for this activity. Variations: You could use flower petals, crumpled pieces of pink, red, and white tissue paper, heart-shaped balloons, etc. If the weather outside is nice, you could even enjoy this activity outdoors. This is the arts & crafts day of the week. Many crafts involve hearts. You will find a few suggestions below, but don’t hesitate to create your own unique masterpieces if you feel these ideas don’t match your group’s interests or abilities. Trace a heart shape on a piece of black construction paper. Crumple tiny pieces of torn red, pink, and white tissue paper. Have children fill their heart shape with the crumpled pieces of tissue paper. Press heart-shaped cookie cutters in white glue and use them to make prints on pretty paper. Sprinkle the hearts with glitter. (Open models-hearts) Print a model for each child. Have children fill their heart shape with white glue. Once this step is done, provide red and pink rice (that you dyed ahead of time) and let them press the grains in the glue to fill the shape. Mix the ingredients together (must be done by an adult). Do not eat. Cut two identical heart shapes out of waxed paper for each child. Mix corn syrup and red food coloring together. Children use this mixture to paint one heart. When they are done, have them set the second heart on top of the first one. Let dry and hang to decorate your daycare. 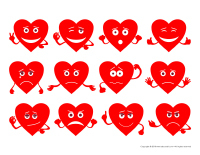 (Open educa-shape-Chick-Hearts) Print several copies and set the pieces on a table. Encourage children to color the pieces they wish to use. When they are done, have them cut them out and assemble them to represent a chick. They can use the model as a guide. This activity can be done individually or as a group using the small, medium, or large shapes. Invite children to add eyes, a tongue, and even legs to their chick. Gather your group of little bakers in the kitchen to prepare a heart-filled recipe. You will find a few simple suggestions below. Prepare a traditional Rice Krispies treat recipe, but add a few drops of food coloring to your melted marshmallows. Press the mixture in heart-shaped cookie cutters or roll it into tiny balls. Prick the hearts (or the balls) with Popsicle sticks and roll them in candy hearts and Valentine’s Day sprinkles. You will need chocolate candy melts and lollipop moulds (ask parents if they have moulds they could share with your group). Have fun melting the chocolate and pouring it in the moulds with your group. Prepare one or two recipes of red Jell-O. Pour the preparation in a large rectangular pan to create a large but not too thick surface. Set the pan in the refrigerator until the Jell-O is set. Use heart-shaped cookie cutters to cut heart shapes out of the Jell-O. Serve the hearts with a dollop of whipped cream. Prepare your favorite sugar cookie recipe with your group. Use heart-shaped cookie cutters. Let children decorate the heart-shaped cookies with red, pink, and purple icing. Add sweet Valentine’s Day sprinkles. Treasure hunts are always popular. In general, the simpler the activity, the more children appreciate it. Here are a few ideas that are sure to please. Cut several hearts out of colourful construction paper and hide them throughout the daycare. Have children search for them. Every time they find a heart, have them stick it on a large heart displayed on the wall. Cut several hearts out of construction paper and cut each one in half. Stick one half of each heart on the wall and hide the other halves. Children search for the cut hearts. Every time they find one, they must find the corresponding heart on the wall and stick both parts together. Hide paper hearts in your yard and invite children to search for them. During naptime, hide chocolate hearts throughout your daycare to provide children with a quick game (and treat) when they wake up. 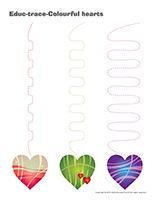 (Open transition games-Colourful hearts) Print each illustration twice. Use adhesive paper to secure one copy of each illustration on the table. Deposit the second copy of each illustration in an opaque bag and invite children to pick a card that will determine their spot at the table (corresponding illustration). The illustrations can also be used to determine children’s naptime spots or their place in the task train. (Open transition games-Colourful hearts) Print, laminate, and arrange the illustrations on the floor to create a path that leads to different areas frequently visited by children within your daycare. For example, the path may lead to the bathroom, the cloakroom, etc. It could also delimit your workshops. 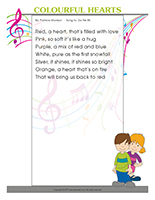 (Open educ-trace-Colourful hearts) Print for each child. Children must trace the lines using a crayon of the designated color and then color the item at the end of each line with the corresponding color. (Educa-symmetry-Colourful hearts) Print. Children must color the picture on the bottom to make it look exactly like the picture on the top. (Open educ-pairs-Colourful hearts) Print. 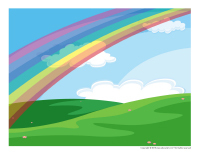 Children must draw a line between identical items or color them using the same color. For durable, eco-friendly use, laminate and use dry-erase markers. (Open color by number-Colourful hearts) Children must color the picture per the color code. (Open educ-intruder-Colourful hearts) Print and laminate. Children must find the six (6) intruders in the scene. (Open puppets-Colourful hearts) Print the various models on cardboard. Ask children to cut them out and decorate them with arts & crafts materials. Glue a Popsicle stick behind each one to complete the puppets. 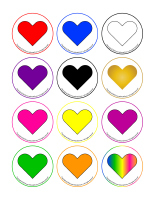 (Open models-Colourful hearts) Print the models and use them for your various projects and needs throughout the theme. (Open I am learning to draw-Hearts) Print and laminate the model. Invite children to practice their drawing technique on the model sheet before letting them draw independently. 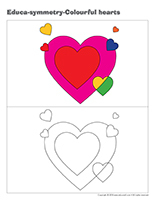 (Open coloring pages theme-Colourful hearts) Print for each child.